Even a homeowner who's experienced at home repair may need to hire a contractor for larger, difficult jobs. Before you do, there are a few things you should check; let's take a look. Choose a contractor carefully. The contractor you hire should have the technical, business, and interpersonal skills to get the job you want, done. It's not a decision you should rush into. A good source of referrals may be a relative, a friend, or neighbor who recently had a good experience with a contractor. You can also check with your local Home Building Centre. You want to ask a lot of questions like: How long have you been in business? What kind of work are you licensed to do? Are you covered by insurance and workmen's compensation? You'll find a complete list of questions on hiringacontractor.com But the best proof of quality is satisfied customers. If the contractor plans to do the work alone, make sure to check credentials. You can do this with provincial licensing boards or online services. 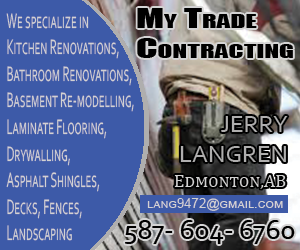 Your contractor should have references from at least 3 previous customers who had similar work done. Call the references and talk with them and, if possible, see the work. Be sure you can get along with the contractor. You want someone who can help you refine your plans when necessary or help you save money. If you can't communicate effectively, things can get messy. You generally want to get 3 estimates with sufficient information to help you make a decision. For substantial projects, get good quality drawings. From large to small projects, Home has the plans you need. Even with a small project, a set of written specifications is needed. Be as specific as you can. List the type of flooring you need, the brand of doors and windows you want, and the kind of finishes you're looking for and so on. Remember, renovations may uncover hidden problems with your home, so make sure to include a contingency budget to cover unforeseen costs. Look for a fair price, don't automatically choose the lowest estimate. The contractor may not have understood the project or may be under estimating what it will take to do the job, or simply under bidding. In any case, you may end up with unexpected additional costs. Contractors who insist on cash and no contract can be a red flag. This underground economy transaction has a lot of risks, including poor work and creating health and safety problems. You could wind up responsible for unpaid bills for materials. And if something does go wrong, you have no legal recourse. It's best to work with the detailed written contract between you and your builder. There are several types, including a cost-plus contract and a design-build contract. Thanks for watching. Look for more tips on building and renovating, as well as decorating, cooking, gardening, and other topics, at homehardware.ca Get more information on your home renovation from our Home Installs professionals. Our professional consultants can help you design your renovation and supervise the construction from start to finish, with the guaranteed completion date and cost.